When no celebratory 40th anniversary Nautilus appeared at Patek Philippe’s luxurious stand at Baselworld 2016, many collectors were crestfallen. But with 30 new or updated models, the Geneva brand quickly made amends in the eyes of most enthusiasts, many of whom also prize Patek Philippe’s world timers. The new Patek Philippe World Time Chronograph Ref. 5930G appeared to mitigate their mild disappointment. The new watch combines two of the Geneva watchmaker’s best-known functions: chronograph and world timer. It joins these complications essentially for the first time, not including a one-off Patek Philippe watch made in 1940. Now a new member of the company’s regular collection, the Ref. 5930G World Time Chronograph watch takes full advantage of its own technical improvements to the 1930’s Louis Cottier invention to create a more precise, and more complicated, single movement, CH 28-520, which Patek Philippe says is the thinnest of its type anywhere. Ref. 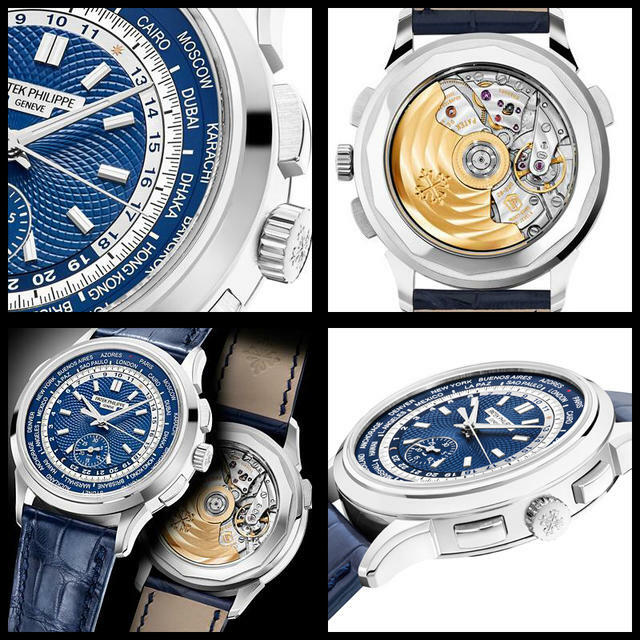 5930G comes in a round 39.5mm white-gold case and a dial with a blue, manually guilloched center. As Patek Philippe chronographs are among the most eclectic of the past century. They include manually wound classics with horizontal clutches, the world’s thinnest split-seconds chronograph with two column wheels, a monopusher chronograph with a minute repeater and an instantaneous perpetual calendar. At the same time Patek Philippe World Time watches are always in demand. This watch combines many of these features, which is why Patek Philippe calls the Ref. 5930G ‘a chronograph on which the sun never sets – because it always indicates all 24 time zones. Where conventional chronographs have a scale graduated in fractions of a second, the World Time Chronograph instead has a moving city disk with place names that each represent one of the 24 international time zones as well as a moving 24-hour ring. On this ring the time is indicated for the city that stands directly above it. With only a single thirty-minute counter, the Ref.5930G keeps its chronograph indication to a bare minimum. The World Time Chronograph’s start/stop pusher is at 2 o’clock and its reset pusher/flyback pusher is at 4 o’clock. If the user presses the reset pusher while the chronograph is running, the sweep hand will ‘fly’ back to zero to start a new time measurement. Thanks to the movement’s vertical clutch, the chronograph hand can be used as a running seconds hand with no affect on the rate accuracy and power reserve of the watch. We’ll have more 2016 Patek Philippe debuts throughoutBaselworld 2016, now until March 24.